We are squandering our planet's natural capital--its biodiversity, water and soil, and climate stability--at a blistering pace. Major changes must be made to steer our planet and people away from our current, doomed course. Though technology has been one of the drivers of the current trend of unsustainable development, it is also one of the essential tools for remedying it. 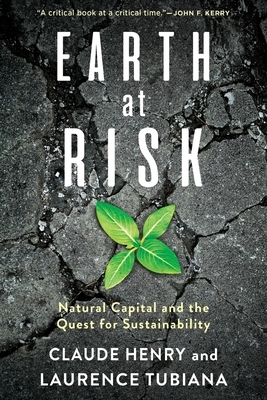 Earth at Risk maps out the necessary transition to sustainability, detailing the innovations in science and technology, along with law, institutional design, and economics, that can and must be put to use to avert environmental catastrophe. Claude Henry and Laurence Tubiana begin with a measure of the costs of ecological damage--the erosion of biodiversity; air, water, and soil pollution; and the wide-reaching effects of climate change--and then consider the solutions that are either now available or close on the horizon and that may lead to a more sustainable global trajectory. What community-driven or market-based tools can be used to promote sustainable development? How can renewable energy and energy storage advances help us decrease our use of fossil fuels? How can we substitute agroecology for the damaging chemical methods of industrialized agriculture? Is international agreement on climate goals possible? Building on the experience of the most significant climate negotiation of the decade, Earth at Risk shows what a world organized along the principles of sustainability could look like, no matter how optimistic it may seem at the present moment. Though formidable obstacles remain to the realization of this significant transition, Henry and Tubiana present the case for collective initiatives and change that build momentum for implementation and action. Claude Henry, a physicist turned economist, is a professor of sustainable development at Sciences Po Paris and at Columbia University. He is also currently president of the Scientific Council of the Institute of Sustainable Development and International Relations. Laurence Tubiana is the founder and director of the Institute of Sustainable Development and International Relations and professor and director of the Sustainable Development Center at Sciences Po Paris. She was the special representative of the French minister of foreign affairs for the 2015 Paris Climate Conference (COP-21) and French ambassador for climate negotiations.